Alessio Planeta, who visits the United States often on behalf of his family’s winery, tried valiantly to explain Sicily’s multitude of terroirs to a group of journalists gathered at Del Posto for a tasting of a selection of Sicily’s indigenous grape varieties. 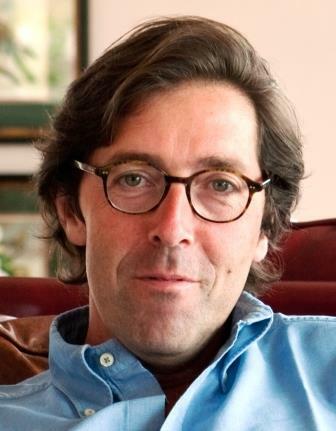 Planeta has a deep interest in this, since the family firm (headed by Alessio and his cousin Francesca, with knowledgeable input from her father/his uncle Diego) has been at the forefront of exploring and exploiting those diverse terroirs and their native grapes. Currently, the Planetas have vineyards in at least six different parts of Sicily, so Alessio had a good deal of information to impart. That was no easy task, since there is a great deal of confusion about Sicily’s geography/geology, even among its residents. Because of its great variety of landscapes, Alessio remarked, people sometimes speak of Sicily as “not an island but a small continent,” and sometimes they refer to the Etna area – the eastern third of Sicily, roughly – as “an island within an island.” No wonder outsiders can find it all confusing. As Professor Attilio Scienza of the Universita di Milano once explained it to me, Sicily really has two totally different geologies. The eastern third of the island is purely volcanic: Etna is the southernmost of a series of volcanoes that once ran down the length of Italy. Long ago, it rose above the sea and formed that chunk of land. The western two-thirds of Sicily consist of a very variegated piece of the North African karst that drifted north and got caught on or by the volcanic piece. 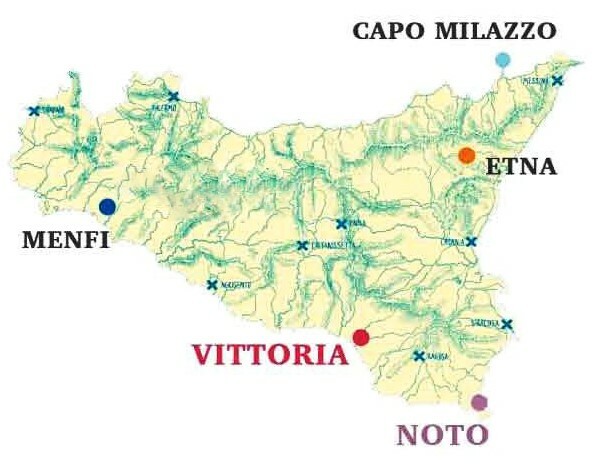 So on the eastern part of Sicily you find volcanic soils of different ages and varying mineral traces, and on the western you have the whole variety of soils that can be found on continental North Africa. It all matters greatly, because different grape varieties do well – and the same grape variety performs differently – on the different soils in different parts of the island. That is exactly what the Planetas have set about investigating, so Alessio led us on a tasting tour of some of the family’s vineyards, focusing primarily on what happens to Nero d’Avola, one of Sicily’s most important red grapes, in those different locales – to wit, Menfi, Vittoria, Noto, Etna, and Milazzo. Well, we skipped Etna, for the simple reason that Nero d’Avola doesn’t do well there at all – Nerello Mascalese is the red variety that excels there – but we palatally visited all the other areas. Dorilli Cerasuolo di Vittoria Classico DOCG 2014. 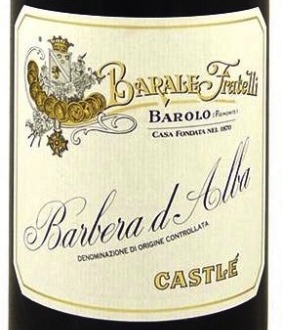 A cru wine made from 70% Nero d’Avola and 30% Frappato. All these wines so far saw no wood: all stainless steel fermentation and aging. This particular bottle was slightly closed on the nose, but showed lush cherry and chocolate notes on the palate: very nice indeed. 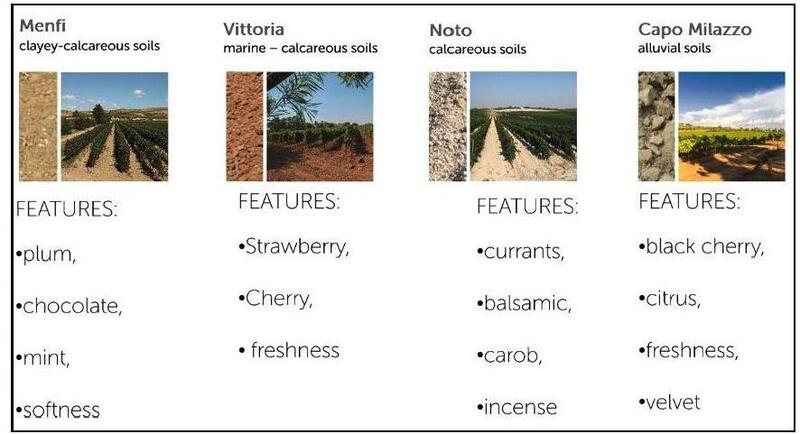 Alessio said that Vittoria’s marine/calcareous soils yielded Nero d’Avola marked by strawberry and cherry aromas and tastes, showing great freshness. I didn’t pick up much strawberry, but about the cherry and the marked freshness I emphatically agree. Then, to demonstrate that this seemingly ephemeral light wine could age well, Alessio showed a Cerasuolo di Vittoria DOCG 2007. This nine-year-old perfectly proved his point: It had an intense cherry/strawberry nose and palate, with a very long finish. Despite its age, it still felt light and agile. This was a completely enjoyable wine that I would go so far as to call distinguished. Any wine drinker would love this with the ritual holiday turkey. Nero d’Avola Nocera Sicilia DOC 2014. 70% Nero d’Avola, 30% Nocera. Fermented in stainless steel, with 14 days’ maceration on the skins, and four months’ aging in used barriques before bottling. This wine had a very nice cherry and anise nose and palate and finished long – very good drinking. Alessio described the Nero d’Avola of this area as showing cherry and citrus flavors, with great freshness and a velvety mouth feel. I got more anise than citrus, but otherwise his comments tally very well with my tasting notes. He then zigzagged us, geographically, to the Noto area, near Siracusa on Sicily’s southeast coast, to taste Noto Nero d’Avola DOC 2012. 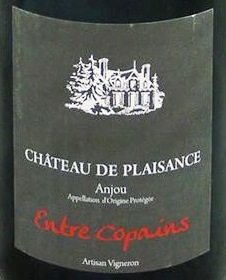 This wine is fermented and macerated in stainless steel, then racked and aged for ten months in second- and third-use Allier barriques. Alessio says that the features of Nero d’Avola from this area are incense aromas, as well as aromas and flavors of currants and carob, plus balsamic notes – quite a complex medley, in fact. And that was indeed what I tasted, though I think some of those more exotic notes may have come from the barriques rather than the grapes. Next came Santa Cecilia Noto DOC 2011, 100% Nero d’Avola and vinified in exactly the same way as the preceding wine. This example was intense and deeply characteristic in both the nose and the mouth, with the black currant flavors especially prominent – a very elegant and very long-finishing wine. Incidentally, 2011 is Alessio’s favorite of all the recent vintages. Drunk again with the lunch following the formal tasting, this wine showed very, very well – elegant, with dried cherry notes and hints of chocolate and tobacco, and an almost sweet finish. The final wine of the formal tasting was Santa Cecilia Noto DOC 2010, once again 100% Nero d’Avola, steel-fermented and oak-aged. I found this wine very aromatic and edgy, though round in the mouth, soft and deep, with the elegance that seems to be a hallmark of the Noto zone. I thought it fine, though I feel it really wants more aging. With the lunch, we drank the 2011 again, as I mentioned above, as well as 2007 and 2005 Santa Cecilia Noto DOC. I found the ’07 slightly closed, needing time in the glass to open at all. It should be wonderful in a few years: This may merely be that dumb phase that so many substantial red wines go through. The ’05 was excellent, still fresh, though maturing beautifully, with lots of years still in front of it. As it opened in the glass, it just got fresher and fresher – very impressive indeed. Thus ended the geography lesson, which gave me a greater understanding of how much more there is to learn about Sicilian varieties and their regional characters and just how much more than we have yet seen they may be capable of. 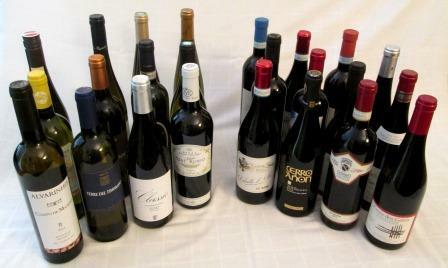 That’s what’s most exciting for me about Italian wine: no region of Italy has hit its limit yet.